Topics: Graphic Design, and This Simple Form. The site has about 23 users daily, viewing on average 1.10 pages each. Its 2 nameservers are ns2.mainnameserver.com, and ns.mainnameserver.com. It is hosted by Heart Internet Ltd England, using Apache/2 web server. 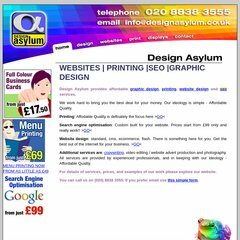 Designasylum.co.uk's server IP number is 79.170.44.122. PING www. (79.170.44.122) 56(84) bytes of data.